In Part 1 of my recap of the 2017 BIM Conference in Las Vegas, I focused on my overall experience and the Print Shop Problem: Letting the least sophisticated endpoint drive the decision making process. In Part 2 I discussed how Ken Huggins and my own lecture made me rethink what my ARCHICAD template will look like in ARCHICAD 21. In part 3, I focused on CineRender advice from Zoltan Toth’s lecture—and subsequent discussions with him. In this final recap post, I want to talk about another inspirational experience, and the future. Patrick May gave a presentation on GDL scripting for people who don’t know how to script. I left that presentation motivated to finally learn GDL. I’ve dabbled before. I can open up an Object and usually find the data I need to. A long time ago, I made copies of OOTB (out of the box) ARCHICAD markers and edited them to suit my needs. If I save a new Object from ARCHICAD geometry, I can open the Object and explore it a bit (here’s one video on that and another). But I have never created anything from scratch. Until Patrick’s talk, I’d never had someone methodically share the basics of GDL. Patrick’s talk gave me enough context to start learning GDL: a few nuggets of wisdom that I can implement immediately and more importantly reference points for further exploration and discussion. I now have the confidence to try. I am motivated and inspired. For this post, I opened up Patrick’s file from his presentation (he gave it to everyone who attended) and tried to redo some of what he taught us. I don’t remember all the details (surprise, surprise), so I just did my best. I remembered how to comment out some of the lines (adding exclamation points in front of a line of script to have that line ignored) and use mul2 and add2 to allow the 2D symbol and the 3D symbol to be different sizes. I also recalled from Patrick’s talk how to create new parameters. If you missed Patrick’s lecture, a lot of his advice is on his noscriptGDL website. In addition Patrick’s advice and examples, that website also has links to other good resources. If you have other questions about his lecture, reach out to Patrick on his website, Twitter, or Facebook. 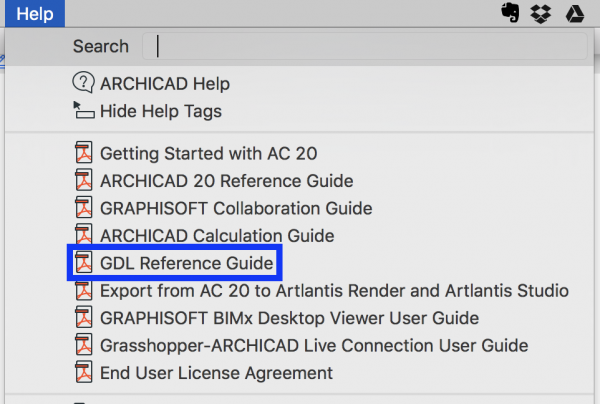 For more GDL knowledge explore the GDL Reference Guide in the help menu, wander around the GRAPHISOFT GDL Center, and ask people who know GDL for help. 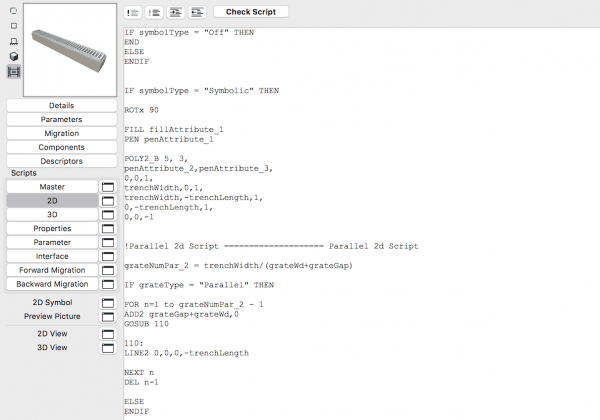 People who script GDL always want to help others fall in love with this powerful tool hidden within ARCHICAD. Patrick’s widely attended and well received lecture wasn’t the only time when GDL was discussed. If you attended the conference and talked with James Murray for any length of time, odds are—no matter what you were talking about—GDL was mentioned. You might (should) know James from his long running ARCHICAD blog Onland.info (I think it might be the LONGEST running ARCHICAD blog). James started Onland.info back in 2003, two months after I graduated from college. 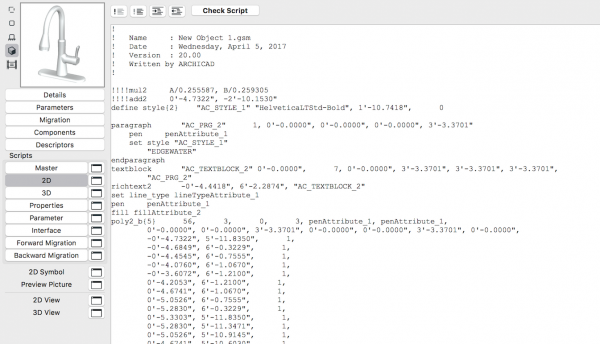 Onland.info is a company blog to help James’ coworkers use ARCHICAD, but it’s filled with advice for all users. James is an ardent (militant?) GDL user, thus many (most?) of his solutions involve ingeniously scripted Objects. About the time we all went to Las Vegas, James needed an American flag in one of his models. Instead of using an image or kludging together some Morphbarf (James’ favorite term for using geometry from ARCHICAD rather than scripted shapes directly from GDL), James used his GDL prowess and scripted a flag. Talking about this one night over dinner, another ARCHICAD friend of ours who lives in Puerto Rico requested James make the Puerto Rican flag as well. 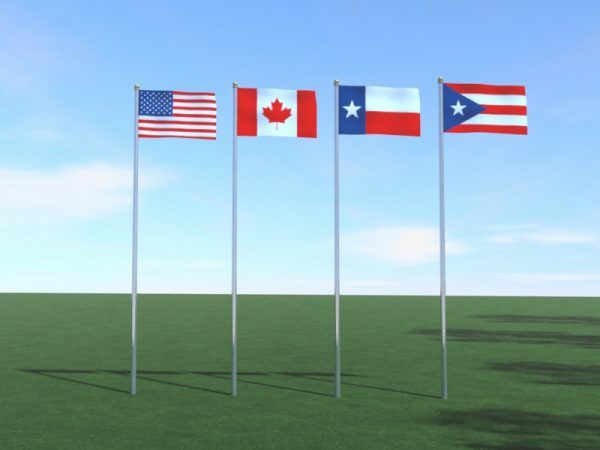 What resulted was a parametric flag that can handle (for now) flags for the USA, Puerto Rico, Canada, and Texas (Because why not Texas). Learn more about what James did and download the flag for your own usage. What does James’ GDL flag have to do with the conference? It’s my favorite example of all the wonderful conversations that happened while we were all together in Las Vegas. I’m sure I could fill another blog post or two with other anecdotes of what happens when ARCHICAD users get together and talk. But four posts of reflections is enough. And we still need to think about the future. In my 2013 and 2015 recaps I talked a lot about meeting people and the future of our community. At the 2017 event I spent so much time talking with my ARCHICAD family that I didn’t do as good a job meeting new users. There were so many people to talk to and not enough time. I still met a lot of people, but I didn’t leave Las Vegas with as many new friends as I had in previous years (sorry!). Instead I left with stronger bonds to the people I knew. Maybe that’s because I knew so many users that everyone felt like an old friend. One group I spent time talking to were five people from a firm that recently transitioned to ARCHICAD. Eighteen months ago, I spoke at the CRAN Symposium. My lecture was on BIM and Beauty (I love that topic). After my lecture there, I got to talking with my friend and her coworkers. They weren’t satisfied with their production tool and were impressed with what was in my presentation. My talk wasn’t about ARCHICAD, but it was clear that I was using a powerful tool. This firm subsequently talked to GRAPHISOFT—who regularly sponsors the CRAN Symposium—and switched to ARCHICAD. Within a few months they had almost a half dozen licenses. Five people from that firm, my good friend included, attended the 2017 BIM Conference. We chatted and I introduced them to a number of other ARCHICAD users. They are doing some amazing things with BIMx and I wanted them to connect with others also doing amazing BIMx models (especially Chris from this blog post, who by the way is no longer a sole practitioner because he has so much work). I sat next to or near this team of new ARCHICAD users at a number of the sessions. I talked with them after one of my lectures and most importantly I sat two rows behind them during Patrick’s GDL session. I watched this team absorb everything Patrick said. At least one of them was furiously taking notes. From my earlier conversations with them back at the CRAN Symposium—and in the intervening months—I know they are big tech nerds. They love BIMx, VR, videogames, etc. A year from now one of them will be a GDL master. I told them I want to see them as a group speaking at the next big GRAPHISOFT event. They are an awesome example of a firm who switched to ARCHICAD during version 18 or 19 and have completely reworked how they do business. And they’ve only just begun. I expect you’ll see a blog post or two highlighting their achievements before long. 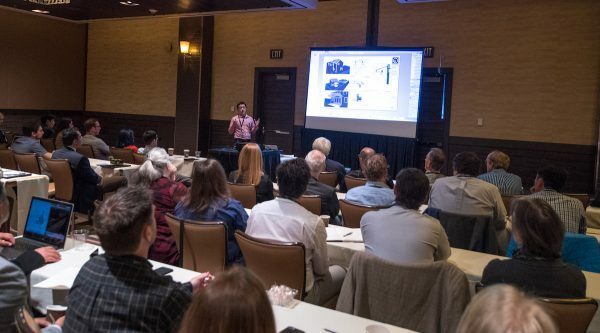 In my 2015 BIM Conference recap, I ended with some thoughts on the next generation of ARCHICAD power users and speakers. I was hopeful that in 2017 we’d see lots of new voices. There were a few in 2017, but not enough. As I look ahead to 2019 (it seems like we’re on a solid bi-yearly cycle now), I daydream about a few things. I want to hear from those new voices. After all, a user who started with ARCHICAD 17 or 18 in 2014 or 2015, will have been using ARCHICAD for four or five years by 2019. Plenty of time to become an expert. But then again maybe it’ll take that group until 2021 to really take the reigns. After seeing so many great talks this year, I also want many of the speakers to return and give updates to what they shared this year. What will Ken Adler and Ken Huggins have to say in another two years? How much can Patrick May teach us about Object creation in 2019? What sort of VR magic will Willard Williams know in two more years? What new CineRender secrets will Zoltan be able to show us? What will I want to talk about? I loved giving my Automatic Beauty talk. I’ve been giving variations of that lecture for years. It continues to evolve and move towards deeper things that I really care about. I’d enjoy giving an update on how I’m automating my work in another two years. But I have other things I want to accomplish at our next conference. I want to host a power user panel like I did in 2015. I want to run a session that is just a user group; ninety minutes of me in front of a laptop with people asking questions. I’d do what I usually do at my user group: open up a recent project, show one quick thing, and then get people talking. 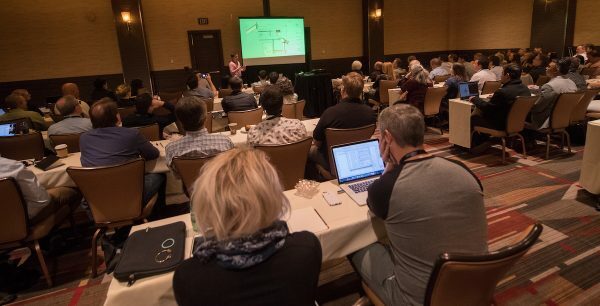 Doing a user group session (or sessions) in 2019 would be special because it’ll mark ten years of me running ARCHICAD user groups. I average about one meeting every two to three months. Over ten years I’ll have run about fifty meetings. I’d love to give more users that experience. They’ll not only learn something about ARCHICAD, but also get a sense of how a user group should function (here’s four posts I wrote on that topic if you are interested in starting or bolstering a user group). That’s the simple idea. Here’s my grand idea: I want to convince GRAPHISOFT to give me a room and a signup sheet. I want to have a space at the next user conference where attendees stand up and present a project. Give each person fifteen or twenty minutes to share a project live in ARCHICAD, allowing everyone in the room to see how others use the program, ask questions, and seek help. A long time user would get up there to show off something unique and special. A GDL guru would talk about their latest Object. A newer user would just ask for help on how to solve certain issues. Who knows. All I know is that it’d be a ton of fun and everyone would learn. 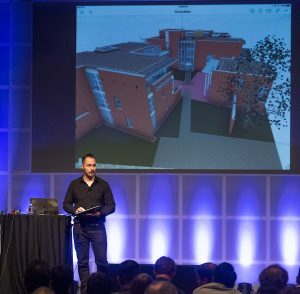 All three GRAPHISOFT BIM Conferences have been super educational, for users of all levels of experience. When registration opens for the next event, sign up and come. Be prepared to share. Submit a lecture topic. Offer to bring a project to present if I can get my crazy scheme to work. Open yourself up to learning and listening. New user. Old user. Doesn’t matter. There’s so much to learn. And so many people to talk to.